Nestled amidst lush foliage on the side of a terraced hillside overlooking the blue Pacific, sits one of the most eye-appealing and long lasting businesses in operation in San Clemente today. In existence for over 18 years, this tennis lover’s haven is known as the Rancho San Clemente Tennis and Fitness Club, and it is the pride and joy - and second such venture - of its developer and limited partnership owner and manager, Lloyd Harline, Jr. The building of this club has its roots in Lloyd Harline’s dreams as a young man and college student at Brigham Young University in Provo, UT. Dreams filled with the desire of having a business of his own in some aspect of the sports field. And in the early ‘70s, when the sport of tennis was experiencing a popularity boom, it would be his friendship with Fresno State University’s tennis coach, Duane Ballard, that would soon set him on the path to realizing those dreams. In a conversation these two friends had one day, discussing the number of tennis clubs in proportion to Fresno’s population, Lloyd was surprised to learn that there were only two clubs available in town. At that time both the city and its population were experiencing rapid growth, and the enterprising young Harline surmised that two clubs weren’t going to be enough to accommodate the future expansion. So at the ripe old age of 27, he did some research, found a great location and set out to find a million dollars in funding for building his dream. But take a chance that investor did, and the Sierra Sport and Racquet club, designed and developed by Lloyd himself, opened up in Fresno in 1977. The plot plan he drew up consisted of a two court, side-by-side layout, a design creating more open spectator viewing and providing room for a greenbelt landscaping that would enhance the beauty of the grounds around the courts. Upon opening the club was immediately popular and well-attended, and in 1980, after operating for only three years, Harline received an offer he couldn’t refuse and he sold the Sierra Club at a handsome profit. The tennis and fitness club under construction in 1987. 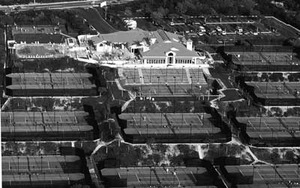 Having grown up in Redondo Beach, CA, Lloyd was now anxious to return to Southern California, so he began looking for a place to develop a new tennis facility there. On one of his searches he happened upon the early stages of the Rancho San Clemente development, and after speaking with the builders he discovered that the land at the entrance to the project had been slated for a community clubhouse hosting two tennis courts. Armed with that knowledge he knew he had found the spot for his new club, and after almost a year of negotiating, he convinced the developers to fly to Fresno to look at the Sierra Club. They liked what they saw and decided a tennis and fitness facility would not only be a showplace for their development, but would be much more cost effective than a clubhouse that they would be responsible to maintain. They not only agreed to sell Harline the land, they agreed to carry the loan necessary to build the club. And upon enlisting the services of his Uncle, a home builder, to construct the clubhouse, Lloyd set about designing and developing, not only the clubhouse and restaurant, but also the terraced layout for the tennis courts and the grounds themselves. 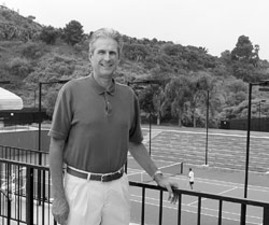 Upon driving into the tree-shaded parking lot and entering the elegant Mediterranean styled Rancho San Clemente Tennis and Fitness clubhouse, it is obvious Lloyd Harline achieved that goal. Inside one is instantly showered with light, as the building’s high ceilings and multi-windowed walls create the illusion of being outside, inside. In every area of the facility, within and without, glass abounds, providing open viewing and panoramic views of the ocean. The building and the grounds are all about levels. At entrance, a level for the fitness facilities, locker rooms, a pro-shop and bar, pool sauna and basketball court. Inside, a step-down level to an onsite restaurant, with the final leveling being the many-faceted terraces that lead to each dual set of the facility’s 19 lighted tennis courts. Aerial of the club today. Membership in this club requires an initiation fee and monthly dues. Full facility as well as fitness only memberships are available. According to Harline, the club’s tennis is mostly about leagues and ladders. Inter- and intra-club leagues, like Pacific Sun, USTA, men and women’s leagues and men and women’s singles and doubles ladders, are offered. Men and women’s 50-plus early morning groups, mixed doubles nights, as well as match making, consisting of match courts held on week-ends, are also among the many scheduled tennis activities there. Four tennis professionals are on site for lessons, including former tour player, Bob Lutz. And while the junior players in the club enjoy clinics, leagues, tournaments and camps, those members with either a full facility or fitness only membership are privy to work out classes, gym equipment, free weights, locker rooms, pool and sauna. In the ‘80s, shortly after opening, RSC hosted the Audi Challenge featuring the top eight women’s tour players including doubles partners Martina Navratalova and Pam Shriver. Success hasn’t always come easy for Rancho San Clemente and Lloyd Harline. After the tennis boom in the ‘70s and ‘80s the game went into a slump and many clubs in South Orange County closed down. Lloyd speaks of those as tough times for all tennis club owners. But with his faith, and the knowledge that the development of San Clemente would eventually bring more memberships to the club, his business has survived. Today, Rancho San Clemente Tennis and Fitness Club is looking toward a brighter future. As for its owner, Harline, he is grateful for being in a business that he loves, one that has given him the freedom to enjoy and participate more fully in the lives of his three children and grandchildren. A freedom that might otherwise not have been possible, had he chosen not to follow his dreams.